The MGM Grand Garden was the perfect place for the Stones' last show in America - for now. This was the typical festive Las Vegas show, a feeling of celebration and no sense of finality like the last No Security show in San Jose 1999. Yes, the band is leaving America but it is headed to every other part of the planet. Tonight Keith put it best: between his two songs he said, "This is our last show in the U.S. of A. I hope you're still here when we come back!" What a great thought as Keith pointed out rather than worrying about the mortality of the Rolling Stones, we each should worry about our own. He went on to underscore that thought with a smoking version of Before They Make Me Run. The show began with a slightly different Start Me Up, which seemed just a bit slower than usual. The tempo really made the reggae roots of the song apparent. It's Only Rock and Roll was a big stage minimal version, without backing vocalists. The album theme for the evening was Let It Bleed. Monkey Man had a sloppy start, with Mick dancing around and then realizing he did not have a microphone. He darted to the back of the stage, picked up his mic, and joined the song in mid lyric in sync with the rest of the band. It was a very good save. 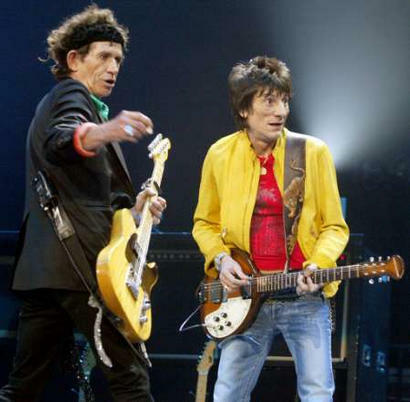 The song Let It Bleed benefited from Ron Wood's excellent slide guitar lead, with Ron out front as Mick, Keith, and Daryl huddled in front of Charlie all banging away with rhythmic intensity. Can't You Hear Me Knocking seemed to lull the crowd, but it was good as always. This song developed over the past five months into a consistently great spaced out rock/jazz jam. It surely will be looked upon as one of the representative songs of the LICKS tour. And who would have ever thought that Ron Wood would so skillfully attack the song like he did so many nights on this tour? Can't You Hear Me Knocking will be a gem to remember from the LICKS tour, like Moonlight Mile or Some Girls are great memories from the No Security tour. Gimme Shelter was close to perfect with Lisa hitting the high, long note and Keith's guitar snaking around Mick and Lisa's vocals with precise timing. Honky Tonk Women and Satisfaction were also right on with Keith playing extremely well. At the end of Honky Tonk Women as I watched the girl in the accompanying animation slip down the throat of the trademark Stones mouth for the last time, I felt sad. While the Stones will be back, it is unlikely this cartoon leathered lovely will be seen again in America. When the Stones went to the small stage, someone threw a string of pearls near Keith. Instead of just picking them up and putting them aside, Keith carefully attached them to his belt, where they provided ornamentation for the rest of the show. The small stage included some of the best versions of Like A Rolling Stone and Brown Sugar that I have ever seen. The Grand Garden crowd shouted along on Like A Rolling Stone, the song first played in the U.S. at this arena over five years ago. Brown Sugar was extended with Mick whipping up the crowd, Keith and Bobby Keyes trading shots of guitar and saxophone, and Charlie grinning from ear to ear. A big stage encore of Jumping Jack Flash ended this leg of the tour, with people grabbing at the red confetti, always a wonderful free souvenir. So this last scheduled American show was not a fond farewell or sad affair at all, but a rocking show that left me wishing I could head to Australia or Japan to see more. The LICKS tour had more energy, variety, and great playing than any fan could have hoped for. Most of all, as Keith suggested, I just hope I am still here when he and his band come back. I know many Americans share that wish and are already looking forward to the next time. 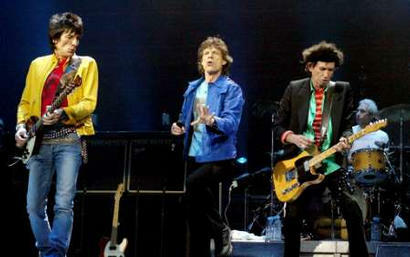 Tonight at the MGM Grand Garden Arena the Rolling Stones played until 3 in the morning! This was the longest and final US show of the Licks Tour. And a show I probably rate the best I have seen since 94! OK, well, it was 3 AM for those of us just arriving from the East Coast. How did I end up in Vegas? I must be doing something right. About three weeks ago I (and thousands of other employees) received an invitation from my company to a mandatory three day meeting. About a half hour after seeing the dates I realized it coincided perfectly with this last show. Viva Rock Vegas baby! Everything seemed to last longer tonight, seemed odd as I expected it all to be over in flash. There were some differences of shows prior. The set list gets mixed and many songs are a little longer - adding up to a nearly two and a half hour show. Keith was on fire as he took center stage cranking Start Me Up under a single spotlight. Jagger came out running and this show was underway. Keith's guitar exploded with the chords to Street Fighting Man. The sound tonight was fantastic (realizing where you are seated has much to do with that). Charlie was pounding the skins and they came through so loud and clear - never better. The show, from my seat had a raw sound to it, perfect. IORR was very good, a longer version, they brought it down just a notch as Mick got us to chorus "I like it!" This has been brought back from the dead, new life and shaken off the label of being War Horse. That can be said of all the War Horses tonight. Sir Michael Jagger has gotten pretty chatty as of late. Before the fourth song he checks us out a bit with that silly grin. He talks of leaving for Australia on Monday, this being the last US show and they were going to make it a good one. "You bit my lip and drew first blood, you wrote your name on my back and ohhh your nails were sharp, Don't Stop!" Mick plays guitar for the entire song, he even went and jammed (mocked) with Keith for a bit. That was interesting; they did share some of each others "space" tonight. Everyone seemed to be having fun and pretty loose. Really good to see these two tonight, Keith was definitely alive and Jagger wasn't holding back at all. While his voice is always great you do notice he usually "protects" it. Tonight at times he was actually screaming lyrics and it sounded great with that unrestraint emotion. Monkey Man rocks as always, true Stones fashion. Mick missed half the first verse with the "left the mic on the table - better run for it now" routine. He picked up in mid lyric and no one seems to mind. Featured tonight is Let It Bleed, the title track is classic on flat top guitar. Again this was different - longer at the end with an extra round of "look at that rider". Nice to throw You Can't Always Get What You Want back in the set, just like Opening Night back in September. Fitting that one of the first songs I ever learned would be in the "last show." Vegas is a pretty good crowd, singing well for this one. Rounding out the Bleed feature was the usually long Midnight Rambler in perfect form, Keith grinding out the riffs. The band is onstage and it's one of those nights - a very good one indeed. What a great song to show the talent of this band in its raunchiest style. It wouldn't have been Vegas without Tumbling Dice! 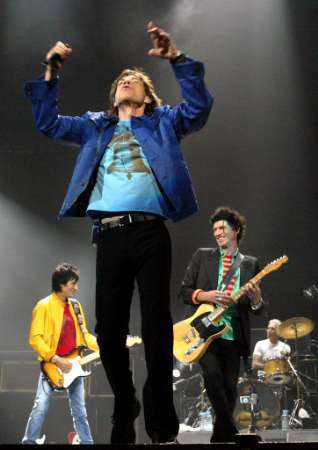 Jagger works the stage, even more athletic than every other amazing show this tour. Running, dancing, twisting and turning in ways most people can't even bend, very fast on his feet. Keith's set tonight was excellent, for the first time in probably 20 years he said something other than, "good to be here/good to be anywhere." He also talked of heading off from the US of A and hopes "we are still here when they get back." Finally I get to see Thru and Thru, Charlie slamming those drums while Keith sings of the blues, you know those blues. Keith's formal goodbye is Before They Make Me Run, and a very gracious bow to his knees after. There is a man that truly appreciates his audience, gives you the impression he for one, is not in it for the money. Jagger reappears, kind of. We see a figure with the flashing tongues covering his body. The drums and the evil shrieks, the red and yellow lights come on to reveal a Sympathetic length coat with probably a dozen flashing lips pinned to it. Tongues on fire on the video. Pleased to meet you, hope you guess my name! With new lighting, Gimme Shelter hits hard, harder every time I see them do it with the US coming closer to another military exercise. The lights are red with a little blue and circling the audience; kind of like a scene in Apocalypse Now with color. Lisa is weak tonight and her co-singer doesn't push her too hard by keeping his highs a little low. Nonetheless the crowd loves her and offers a great applause for a great singer. For years to come I think Can't You Hear Me Knocking is solidified as part of the set. This song belongs to Ronnie, with a little help from Bobby Keys it has become a classic live performance, who could believe they only started doing that on this tour? HTW and Satisfaction were excellent. Before the latter Mick spends a little time rousing the crowd. Two hours into the set before they head off to the B-Stage. Jagger is out there first dragging his sound guy around as he tries to wire him up, pretty funny as he was dancing around teasing the crowd. Which by the way, the crowd was very good tonight! Keith, ever so friendly on the way out, arrives last, You Got Me Rocking. I don't know Sir Mick, you tell me, how does it feel? To be a Rolling Stone? Brown Sugar is packed with excitement as the band works the little stage. A short bow and goodnight! They exit this side of the arena. The lights are still down, then blue, then back to the solo spotlight as Keith riffs one more from the main. Mick sporting the silver fanged trademark for Jumping Jack Flash. Confetti fills the medium sized arena and reaches the upper level, seems they had some extra to get rid of before leaving the country. The final bows are extended tonight. The band seems really appreciative of the last six months in the US. Charlie Watts and Ronnie Wood are last to leave the stage. What a great show. And so that brought a close to the US Tour. I feel pretty lucky to have witnessed the opening night in Boston, the final night in Vegas and several between here and there. Many thanks to Rolling Stones for bringing us such good times filled with trips to places we haven't been, people we wouldn't have met otherwise, great performances and legendary Rock-n-Roll. The music keeps playing, "Always in a hurry, you never stop to worry, don't you see the time flashing' by. Honey, got no money, I'm all sixes and sevens and nines. Say now, baby, I'm a rank outsider, you can be my partner in crime. But baby, I can't stay, you got to roll me and call me the tumbling', roll me and call me the Tumbling' Dice." Vegas baby!